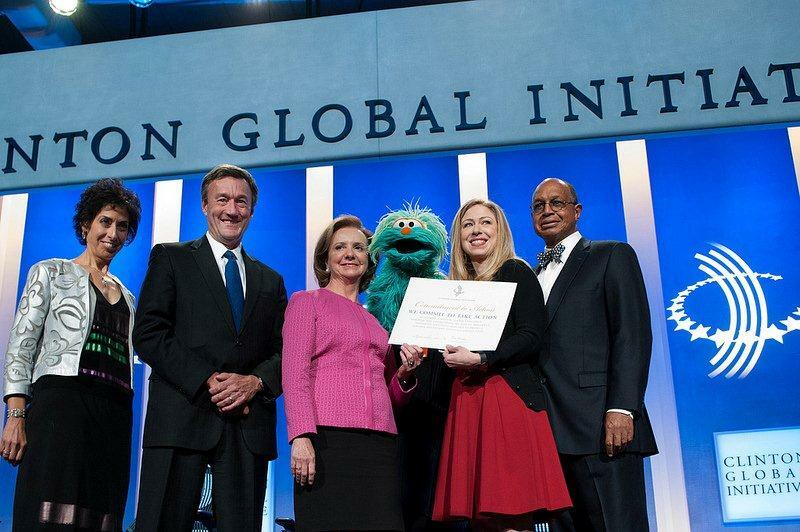 In New York last month, I was honored to be part of the Clinton Global Initiative (CGI) Annual Meeting and proud to be part of a team of partners that help teach children in Latin America how to be healthy – Pro Mujer, Sesame Workshop and Pfizer Latin America. Along the way, I was thrilled to meet Rosita from the Latin version of Sesame Street, Plaza Sésamo. Rosita’s terrific. She’s an integral part of the team that will do important work engaging families on health and wellness. We’re so excited about this project and to be part of Healthy Connections, the Commitment to Action, which will promote healthy behavior and disease prevention among poor women and children in Bolivia, Nicaragua, Peru, Mexico and Argentina. The commitment will use a new technology platform integrating mobile, web and video along with remote training and access to specialists for the physicians who serve the clients of Pro Mujer. Pro Mujer is a transformative organization committed to economic development for poor women in Latin America through microfinancing, training and the provision of health care. Combining the power of Mayo Clinic’s women’s health and wellness expertise with Pro Mujer’s extensive network of health clinics and human development service providers, this commitment will significantly enhance the well-being of women and their families throughout Latin America. The impact of this initiative will be significantly enhanced by the partnership with Sesame Workshop. The iconic Muppets from Latin America will deliver health education messages through traditional and social media and the initiative will be further supported by Pfizer, which will provide technical assistance and operational funding. In New York at CGI, I was joined on stage by the leaders of our partners on this project: Pro Mujer’s President and Chief Executive Officer, Rosario Perez, Sesame Workshop President and CEO, H. Melvin Ming, and the President of Pfizer Latin America, Adele Gulfo for the announcement. The project is one way Mayo is sharing our knowledge in places we feel it can help people most. The project is part of an exciting new initiative led by Dr. Patricia Simmons that we call Mayo Clinic Abroad, Mayo’s international humanitarian program.